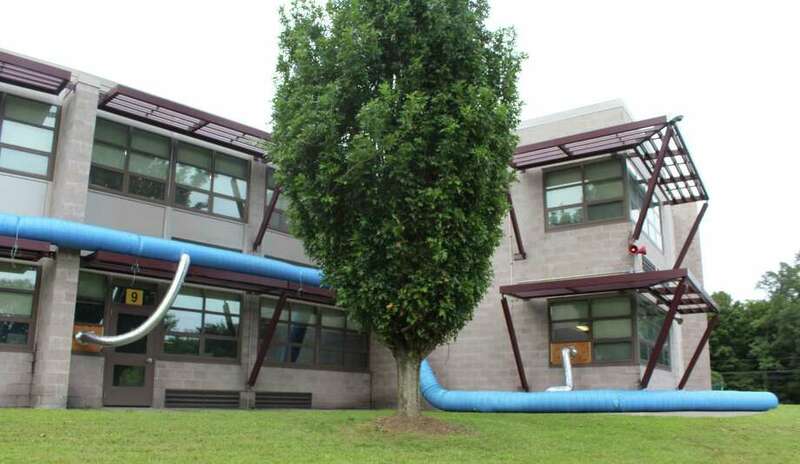 WESTPORT — The Board of Education discussed options for reconfiguring the populations of Westport schools, especially the currently defunct Coleytown Middle School, at its meeting Monday night. Concurrent to the Coleytown Building Committee’s effort to restore the school, which closed due to issues with mold in September and is expected to reopen in August 2020, the education board’s Teaching and Learning Committee undertook an analysis of the school’s demographics to determine which students should return to Coleytown when the school comes back online. Westport’s two middle schools have a severe population imbalance. Because the district is reducing staff to account for decreased enrollment and the absence of Coleytown next year, Westport cannot return to the same pre-closure model when Coleytown reopens, BOE member and Teaching and Learning Chair Candi Savin said. At the start of the year, Coleytown had 457 students while Bedford housed over 400 more, with a total student population of 859. Using demographic projections and scenarios provided by the Cheshire-based civil engineering firm Milone & MacBroom, the board discussed the possibility of redistricting to balance the populations at the two middle schools. The option to turn Coleytown into a “sixth grade academy,” where all of town’s sixth-graders would attend before heading off to seventh and eight grades at Bedford Middle School, was also considered. Savin said she was interested in the idea of a sixth-grade academy because it would create greater parity among all of town’s middle school populations and end “strife” between Coleytown and Bedford parents concerned with the imbalance between the two schools. However, Savin noted she hasn’t heard great support for the idea among residents, many of whom have said they want a return to two 6-8 schools in Westport. BOE member Elaine Whitney said she values the potential specialized programming at a sixth-grade academy, but raised concerns about putting students through two school transitions in the course of two years. With the recent resignation of Superintendent Colleen Palmer, board member Vik Muktavaram questioned how much change the district can take given the upcoming search for new leadership. “The elephant in the room is we don’t have a superintendent right now,” BOE member Karen Kleine said. Kleine asked Assistant Superintendent Anthony Buono, who is filling in for Palmer in her absence, whether he had the capacity to oversee a move to a sixth-grade academy during the leadership transition period. “I think we’re at a point, honestly, that if I was coming into a district as a superintendent they would be able to support whatever decisions made. And I think we’re at a point where were forced to make a decision,” Buono said. Buono added the board should be cognizant of the amount of change it levies on the schools. “A district community can only sustain so much change before it ends up having a negative impact on the overall performance,” he said. Because of the tight timeline to rehabilitate Coleytown by August 2020, BOE member Jeannie Smith encouraged the board to make a decision soon about the future of the school’s population. “We have to do what’s right regardless of how people feel about it. I’m just needing to say that I value everybody’s input and people’s input just depends on their own situation, so we have to think objectively as a board about what are we going to do when we reopen that school,” Smith said. The board will continue discussing future demographic changes to Westport schools at future meetings, BOE Chair Mark Mathias said.